EA has posted Madden NFL 19 player ratings for the top rated rookies. Check them out below and post your thoughts. Just in case you missed it, here’s a list of the top rated players in Madden NFL 19, all of them rated an overall 99. I think their web developer screwed up. Instead of naming the links Top rookie HB he named it Saquan Barkley after the image. It is really confusing at first what you are clicking on. 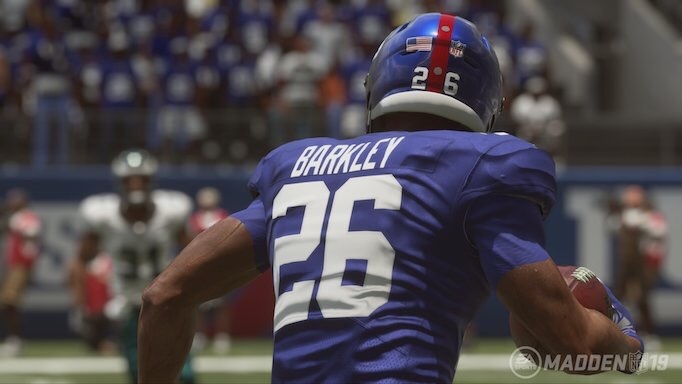 New screenshot of Saquon, I already knew this because of the beta, but he looks much more accurate than he did in the EA play trailer. Am I missing something or is this 25 rookie ratings and not all of them? Why are Jackson and Ridley’s heads so small? OU Die hard fanboy... but i have to kind of scoff at Baker Mayfield getting 95 THP.. id put him at 91 TOPS, with a 92 ish Throw on Run, and short accuracy lowest of them all at 84. Well, that sucked! I was hoping for all the 1st rd picks at the very least. Damn u EA! I'm not qualified to make a judgement about it one way or another, but it is interesting to me that the Madden ratings guys think that Mayfield is that much ahead of Darnold right now. I hope they can fix that before release. Also was hoping they would have a screenshot of each top 5 player. Mayfield is not the best QB in the draft. Would be Josh Rosen, and then Lamar Jackson. It's the Browns. 99.99999% chance Mayfield looks awful his whole career. Remember that the archetype controls the way the overalls are formulated. If you look at Lamar Jackson being a 79 you really quickly see his throwing stats actually aren't that good, but under mobile QB archetype his physical attributes being so high boosts him in overall. I think the days of OVR as a representation of value are numbered because of the archetype system. I really know next to nothing about these guys, but I'll be sure to take a hard stance either way. One of the toughest parts of the ratings guy’s job is rookies. Hype has to be built and they have to do a ton of speculating. Last year soured me a bit when I saw the Cowboys rookies all rated high, but I also understand that there is a balance that lives in the hype/speculation portion. I hate Madden's rating system with a passion. I can't wait until overalls are removed from the game one day. Well, they should get rid of overalls in general - it's not just Madden, but sports games in general. It removes unpredictability from the game which is attempting to emulate a real sport. The moment you draft a player in Madden, despite the changing "slow to superstar" development - you can pretty much predict how that player will turn out. Overalls are junk and have no place in sports games. His accuracy numbers are WAY higher than they should be. Anyone who watched him in college should see that. I'm not saying they are too low or high respective to his talent, but to QB's in general. My point was OVR is not what it is cracked up to be. Mayfield 95 thp? Lmao. But Lamar is gonna be a baaaaad baaaaad man in 19. Pretty sure Lamar Jackson has a stronger arm than Mayfield. Indeed, but to clarify what i said about Mayfield earlier, Jackson is 2nd strongest arm, behind Allen. Then Darnold/Mayfield. A for Mayfields accuracy, i feel like Mayfields SAC should be the lowest of HIS accuracy ratings. because he had a tendancy to be off the mark more on short throws, than medium or deep throws. I just posted it on twitter but PFF mentioned pre draft that Mayfield was in the same range as Allen at the senior bowl in velocity and rotations per minute. Pass velocity numbers are here. But a lot of these players do not pass the eye test at all - Josh Rosen is slightly behind Mayfield and I can tell you that Rosen has a pretty average arm to slightly above average arm. I think my main concern looking at these ratings is whether or not the AI will try to replace Mayfield, Rosen, Jackson, Darnold and Allen with a first round QB in year two. The AI has seemingly knew the OVRs and even though the Bears had Trubisky, the AI in Madden drafted a first round QB because they had a higher OVR than Trubisky thus he was deemed replaceable by the Madden AI. We had to tinker with the ratings of rookie quarterbacks to ensure the AI drafted another position. I know with custom draft classes this will help as we can control the ratings but if you don't use custom draft classes and use the default, then this may still be a problem. Seeing Jets fans react to Darnold's rating will be fun. This was one of the things I mentioned for people to look at in the beta suggestions thread. I hope it got some attention, because you're right that with the way that Madden has been tuned lately, Darnold and Allen are in great danger of being drafted over in the first year, and being relegated to career backup in practically every solo CFM across the world that doesn't have Users controlling those teams. Jackson, Rosen, and especially Mayfield(being over an 80) have better chances. This is a massive issue & one that severely killed my immersion in last year's game, as well as '17. Time and time again I watched the Browns draft QB after QB after QB in the first or second round, all rated somewhere between 75-81 in OVR. By year 6 or so, the Browns had four QB's that could have easily been starting for multiple franchises, only to ride the pine because the AI was too dumb enough to trade them. In fact, the AI would actually RESIGN these guys instead of dumping them into FA. What I don't understand is how they have not worked the AI smart enough to recognize prospects or talent beyond their OVR. I've watched the Steelers draft Josh Allen in the past, labeled as a (80) OVR prospect, yet they snag Blake Bortles in FA, a (81) OVR, and start Bortles, for the duration of his contract, EVEN THOUGH THEY GO 5-11 AND ALLEN HAS SUPERSTAR DEVELOPMENT! There’s a lot of ratings functionality in these rating releases, that’s the only reason I like reading them. Some valuable gameplay info has been passed through these releases. Anthony Miller underrated prob should be around tied for 3rd best overall rookie WR. He doesn’t have any weakness and him and Ridley prob the two best route runners in the draft. Jets fans are used to getting little to no love in Madden. Hard to muster even fake outrage when you are expecting it. LOL But yes, I was disappointed, especially when compared to Jackson and Mayfield. I figured Rosen would be the highest rated since EVERYONE says he is the most NFL ready QB. They gotta get those numbers up. Those are rookie numbers. Jets fans should be fine with his ratings being "low". He really likes to throw it to the other team. Perfect model for a Jets QB. QB roster building logic for CPU teams was a really big issue in '18. Hope it's fixed for '19. This is a real immersion killer for CFM. Personally I agree on that front. But I’m wondering how Baker got 95 throw power, that’s crazy. This is true, but the issue isn’t to up rookie overalls, team AI needs a huge upgrade. Totally agreed on the Browns thing, too accurate. Has to do with him throwing a 60 at the combine which was 2 shy of Allen's 62. My only issue with this is, as I've mentioned previously, this stuff doesn't pass the eye test. While I understand that may not be 100% reliable, does anyone really believe Rosen throws near the velocity Allen does? Rosen had a 59 throwing to the right and 57 to the left. Just watching game film of Rosen will tell you he has a good arm, but it's nowhere near the top. It's middling. But I guess this is a good way to avoid controversy with the average fan - get backlash, and you can just point to combine results. Remember when we had QB of the Future as a player role/badge and it kept the AI from doing just this? I miss some of those. It was bad in 18, I can't comment on 19 but as far as 18 went, editing saved that game for me. Being able to edit the cpu's stupid draft picks prolonged my cfm a few seasons. Based on what? This is lazy. Jackson had one of the worst arms at the combine in velocity. He should have a THP of around 86-88. He might be fast, and an elite runner but his arm talent is not what got him drafted. He's not Michael Vick in that regard, Vick had a cannon. Mayfield is short so people sleep on him but that velocity is no joke. He can sling it. Most of these QB's are overhyped and overrated. Jackson has a cannon. I have seen him zip it in games. At the combine he probably took some off his throws to try and be more accurate. Right so he gets the benefit of the doubt but no other QB at the combine does. If this is really true than Jackson has no chance at succeeding at the NFL level. EA shouldve also done top 5 DL/LB/CB/FS/SS. I like Darnold a lot, but he was far from Consensus best QB other than Browns. Several teams graded Rosen QB1, others had Mayfield, some Darnold. It was all over the place. It’s funny looking at people get so worked up about these ratings, when if your a CFM player, based on M18, the Scheme Fit will affect the OVR value presented. Some players OVR will be higher, while others will drop. This is where a component written in the Franchise Blog comes into play if these particular players are on your team. - Do you altar your Scheme to fit a particular player and start to restructure your roster? AI may need help by switching the Scheme to fit these QB’s considered to be the future of those franchises. Yeah, all sounds great, like when they explained scheme fits and such in the past and it was bare bone and trash. Until I'm in game and have gone through several seasons to see how well this works and how AI adapts with it - there is no way I'm touting the feature. But this still doesn't take away inaccuracies of base stats for players - this just shows that attributes/ratings players have there is very little difference. A Tom Brady can zip a ball into tight coverage like Favre in his prime. Doesn't matter - no uniqueness. Darnold only started 2 years and struggled quite a bit last year. He has a similar college track record to Mark Sanchez tbh. Far from a sure thing. Most scouts disagree. They say he has an adequate but not exceptional arm. He can flip it, but underthrows a lot of deep balls. Basically, he is not Mahomes or Favre. That isn’t even close to true. Darnold was considered to have great POTENTIAL two years ago. But to be frank, Josh Rosen has the best arm talent out of all these QBs, and ran a Pro style offense for much of his career. Character issues hurt him. Mayfield plays like Favre but lacks Favre like arm strength. Darnold has some elusivity and is unafraid of pressure, but he turns the ball over way too much. Josh Allen has a rocket arm, but he has a bunch of issues with decision making and other problems. Jackson is inaccurate and under throws deep balls, but is the Barry Sanders of QBs. Not a single one of these QBs is consensus. The most talented one, I maintain, is Rosen. But he has a grating personality and quarterbacks need to be leaders. Which brings us back to Mayfield. He is the happy medium between all these guys, and it’s probably why he went number one. I don't think that in this instance he's saying that ratings don't matter per se, but that the inflation of ratings for many players don't allow for the true strength and weaknesses of players to show in the game thus making all players play practically the same. Sanchez had not even a full season of starting in college if I remember right. Or just a lone season starting. Darnold was terrible early last season, but really cleaned it up later and was solid the 2nd half of the college season. This whole post is littered with inaccuries. This was one of the less talented QB classes in recent years. There were no sure-thing prospects. And none of them come close to Luck. Luck has been the best prospect to come out probably since Marino or Elway. Or better than those two. When you have Mel Kiper talking up Josh Allen and the Bills even taking him in the top-10 you know something is wrong. Winston, Mariota, and Wentz were all better prospects as well. He was okay the 2nd half. His season ended pretty miserably, though, where he fumbled 2 or 3 times against Ohio State along with throwing a pick 6. He threw for no scores. The guy finished with 22 turnovers which is insanely high. He has a lot of tools that make you think he can be good, so his ceiling is high, but sometimes you have to look at a player for what they are now and right now he's nothing special, a turnover machine, and a guy that really will need a lot of hard work and great coaching to become good. I hope he can turn it around, but history says a guy like Darnold will not become anything more than he has shown to this point. Um, what? Last year was FAR from one of the weakest QB classes in recent years. 5 QB's picked in the first round 4 in the top 10-15 picks. For all the hype Luck got he sure hasn't delivered. Some of it injuries obviously, but no one remembers that. If you don't deliver you'll be considered a bust. Luck will be a bust if he never returns to form. Not sure why you're even suggesting he's in the same conversation as Marino or Elway. That's a joke. Winston and Mariota are marginal at best. With the weapons Winston had last year, his numbers were terrible. Kirk Cousins had similar talent the year before and put up 4900 yards. And Mariota? He was garbage last year, throwing more INTs than TDs. Rosen will easily top both Mariota and Winston. And last year’s class is miles ahead of Winston and Mariota. Watson will be a quality starter for years and Mahomes is going to be a Pro Bowler. Rosen doesn't have that strong of an arm and he couldn't succeed at UCLA. The concerns around him are very real. Luck took the Colts to 11-5 seasons, with what was essentially a dumpster fire. As soon as he isnt there the team becomes a joke again. Andrew Luck might not get the awards, or the adulation he deserves. But in terms of a true MVP in the NFL it is him. Also Mayfield 95 THP is farcical. If you compare Allen THP to Mayfield, it isnt exactly only a 4 point difference is it? Everybody sees the new Marino, Elway, Manning or even Brees, Brady, etc. in the drafted QB's. Fact is every QB drafted in the last 5 years had 1-2 very good seasons, but 1-2 bad seasons too. Winston, Mariota, Carr, Wentz, Goff all had a good year. Some of them already regressed the season after that, Wentz & Goff will need to show they can do it consistently. As long as one of these QB's hasn't shown he can do it 3+ years in a row consistently, they are not on level with the top QB's. And not even talking about the rookies drafted this year who haven't even thrown a ball yet. No one knows if Allen, Darnold, Mayfield, Rosen, etc. will have a good career or not. Recent history tells us they will probably have a really bad rookie season, then we'll see how they develop. Anyone comparing these guys favorably to Winston is a little confused. Winston lost 1 I repeat 1 game in college after winning 25+ in a row, now which one of these QB’s even came close to that..?? Luck V Rodgers is a great debate when the two are healthy.. hopefully Luck gets right again. The QB situation around the League is pretty dire, and losing one of their A-listers is a big blow with Brady and Brees nearing their end. .. Wilson has also carried a pretty lousy offense since Lynch moved on. And that won't change with that D seemingly on the slide. I guess Ken Dorsey really is leagues ahead of all of these guys. Didn't you know? That's why he hardly played in the NFL at all. Too good for the league and he got bored and retired. This gives an idea of the OVR levels players are generated at before any scheme fit is applied against them. Reading this thread and it's clear just how hard a job it is to assign ratings. Even when people agree the ratings are wrong, they differ on whether or not it should be higher or lower. It's hard to fault the developers for the rookie ratings when no one else can come to a consensus. I mean some of the stuff being written in here is just flat out false, its almost like some of you never watched these guys play in college. Yet you think others(including the people doing the rating) are wrong. I agree with this. If the *entire community agreed "whoa, X player is rated way too low" or there was some clear pattern, then maybe I would understand. However, that's not even close to reality. One person thinks Lamar's accuracy is way high, others way low. Same with Baker's THP or X persons speed etc etc etc. I am in the camp of desiring less players in the 90+ range, especially 95+....but there's a guy on this thread who probabaly totally disagrees ha. I don't envy people focused on ratings for sports video games...tough crowd.